This aggressive Trap Read Option play is very hard to stop – exactly because it is so aggressive. Especially if there’s Play Action and Zone Read Options thrown in throughout the coarse of a game. This is the Power of the Power Spread Concept – Aggressively using all 3 elements in the game – Space, Time and Players. What part of the field is going to be exploited? What kind of Time frame is available? Which players will be directly involved and which will be decoys. With the passive aggression of zone blocking, there is more time involved in the play developing, but if the Defense “jumps the gun” and gets out of position, big plays are available. Play Action is a similar concept. Showing a passive look to set up an aggressive attack. Or vice versa. Combined with the overall aggressive scheme of a Trap Block run, the illusion of Time with the Zone Read, is quickly taken away – sometimes with a knock to the jaw. What about the LBs? Well, we can’t forget about them. Because of the fear of the big play and Purdue’s own ideas to combat the Power Spread with big aggression, the RLB and MLB both completely over pursued in the direction that Hyde was moving – the Defense’s right. This left an easy pick off block by TE Jeff Heuerman, executed perfectly. But the big block was LT Jack Mewort on the backside LLB – the only player with a chance at closing the hole. The LLB unfortunately made a bad false step up towards the middle for the cutback, instead of filling the big hole. This made it all the more easy for Mewhort to simply knock him out of Miller’s path. As for the DBs of Purdue, this is the Spread of the Power Spread. Man on Man by both CBs and the FS on the 3 WRs spread across the field, effectively took them out of the play. The left over SS actually fell for the great Fake by Miller/Hyde and ran himself out of the hole. Lastly, WR Devin Smith did a nice job of leading interference on the LCB after Miller cutback and provide ample space for a huge gain. Unfortunately that same LCB took out his frustrations by bouncing Miller’s head off the turf and knocking him out of the game. The PS and OSU got the last laugh. Why does the PS scheme take away Defense Aggression? SPACE – The defense is simply uncertain at all times on which part of the field will be exploited. I’m talking 3D, not just 2D. In other words, “on the ground or in the air” is also an uncertainty. With high quality strong athletes across the country – the heights of which have never been seen before in football – there is not one team out there today with so much of a strength and speed edge that it can sit on its heels. The Power Spread forces that to happen and even an Alabama would struggle to overcome playing from its heels. TIME – The same idea, but different means to an end. Time can be manipulated with uses of the Play Clock. It can also be manipulated in the length a play takes to develop. The aggressive trap blocking scheme is a more aggressive, quick timing scheme than zone blocking. Its a great counter to slower developing plays run throughout the course of a game. Again, the unsuspecting defense is caught off guard. PLAYERS – TEAM – ALL PLAYERS INVOLVED. And the great news is that these schemes work even if some players make a mistake. There’s a type of built in flexibility not before seen in the Pro Schemes of the past. As long as MOST of the players do their jobs, it works. If ALL do their jobs, as in this play, then it’s a big gainer. This used to happen to OSU all the time – a better scheme took away our aggression and made us appear slow. Just look back at the great Sarkisian schemes when USC walloped us in 2008. Until the end of the game when USC got conservative, we looked as slow as a high school team. Suddenly at the end of the game we seemed really fast. SCHEMES PUT THE PLAYERS IN POSITIONS TO EITHER OPTIMIZE OR MINIMIZE THEIR TALENT. 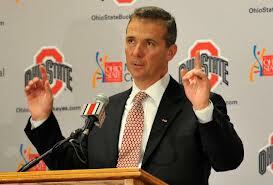 There’s a new Sheriff in town and OSU is leading the way!